Radiohead are going to cover a Peter Gabriel song in the very near future. But before you jump up and down with visions of Thom Yorke singing Big Time, relax - the band plans to put their own spin on a cut called Wallflower from Gabriel's 1982 album Security. 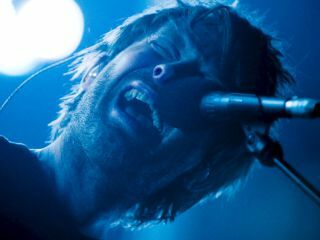 "Thom wanted to do a version of Wallflower, which I'm very curious to hear," Gabriel said in a podcast on his official website. "I think that was an important track for him when he was 14." And in turn, Gabriel can be heard having his way with Radiohead's 1994 single Street Spirit (Fade Out) on his soon-to-be-released covers album, Scratch My Back. The tracklist of Scratch My Back looks pretty cool, with Gabriel tackling numbers by Neil Young (Philadelphia), Talking Heads (Listening Wind), Paul Simon (The Boy In The Bubble), Regina Spektor (Apres Mois) and more. You can even hear him get atmospheric and downright spooky on a powerful version of David Bowie's Heroes - and donate for a good cause - by downloading it at musicforrelief.org.